These pan-fried turnovers, called bolani in Persian and perakai in Pashto, are filled with fresh herbs and potato, pumpkin, or spinach. Though traditionally prepared for special occasions, they are a staple at many Afghan restaurants in America. The first time I made bolani dough, I followed a recipe I found on an Afghan food blog. I had help from a friend whose parents grew up in Mashhad, a town in northeastern Iran, not far from the Afghan border. The dough was very dry and difficult to work with, so I added more water. Although my friend had never prepared Afghan food before, she recalled that the Persian flatbread dough her mom makes is similarly tough and dry. To roll out a thin dough, her mom often has to feed it through a pasta machine. With additional water, the bolani dough is easy to knead and roll out by hand. While I set aside the dough to rest, my friend prepared a spinach, scallion, and cilantro filling. She salted and washed the herbs several times to remove dirt, as her mother learned to do in Iran. Once fried, the dough developed a delightfully flaky, flavorful crust. As delicious as they were, I found the turnovers a bit too rich for my taste. The next time I made bolani, I tried baking them in the oven (apparently, this is becoming a popular method of preparing the turnovers in America.) 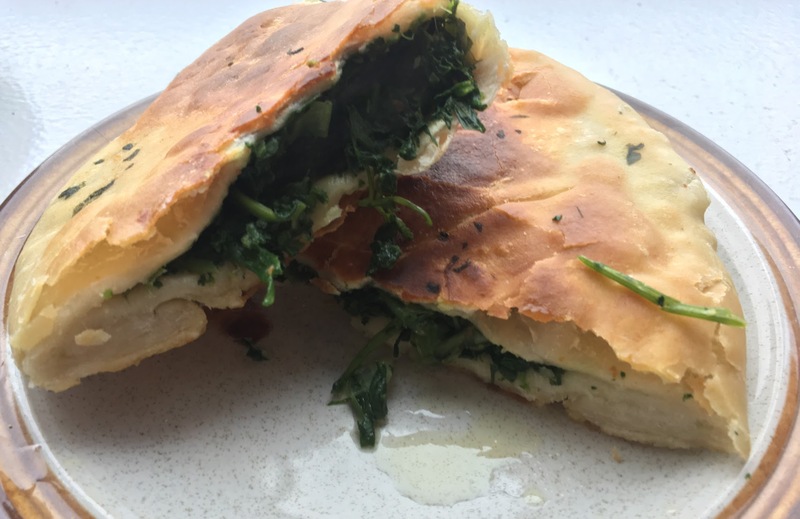 While not quite as flaky and flavorful, the baked bolani were lighter and healthier-tasting, and the flavors of the spinach and fresh herbs really shined through. I’ve included instructions for both baking and frying bolani in the recipe below. Prepare the dough: In a large bowl, mix together flour and salt. In a small bowl, stir together water and olive oil. Slowly add water mixture to flour mixture, stirring together with a fork, until a dough comes together. Directly in the bowl or on a lightly floured surface, knead dough until smooth and elastic. Cover with a towel, and let rest for about an hour. Prepare the filling: Saute spinach, cilantro, and scallions on low heat, until spinach leaves are just wilted. Add salt and pepper to taste. Drain any excess water, and set aside. Fill the turnovers: When dough is done resting, break into 10 even-sized pieces, shape into balls, and then flatten into discs. Roll out each disc with a rolling pin until around 1/8-inch thick. Place a tablespoon of filling in the lower half of each disc, and fold dough over itself, as if making an empanada. Pinch edges to seal. Cook: To bake the turnovers, heat oven to 400 degrees F. Line a baking tray with parchment paper, and place turnovers on tray. Optional, for a crisper crust: using a pastry brush, coat the tops of each turnover with olive oil. Bake for around 25 minutes, until the tops develop golden-brown spots. To fry the turnovers, heat 1/4 cup of oil in a skillet on a medium-high burner. When oil is sizzling, add bolanis, three or four at a time. Fry for around 5 minutes on each side, until golden brown. Add more oil to the pan as needed. When bolani are finished cooking, transfer to a paper towel lined plate. Store leftover bolani in an airtight container or plastic ziploc bag and refrigerate.